Over the decades, as University of Wisconsin­–Madison Biotechnology Training Program (BTP) trainees finish their doctoral degrees and enter the field of biotechnology, a sort of family tree begins to emerge. BTP alumni look for others with similar skill sets and turn to the current pool of BTP trainees and young alumni. At the startup company Stem Pharm, Connie Lebakken, a BTP alumnae who graduated in the late ‘90s and is the company’s president and chief operating officer, took on a trainee Andrew Khalil as an intern in 2016. The two made for a dynamic and hardworking team. More recently, BTP trainee Angie Xie also interned at the company, further strengthening the relationship. Lebakken had similar things to say about Khalil and added that she knew what to expect from a BTP intern because she has been through the program herself. 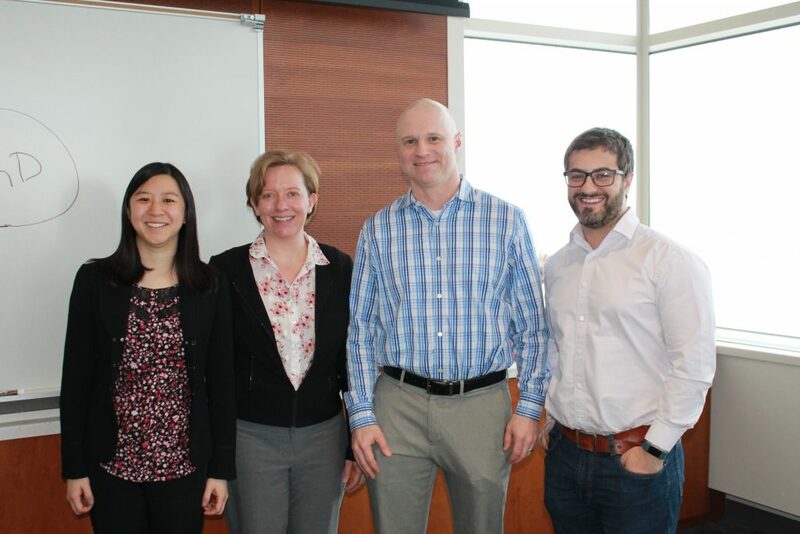 At BTP trainee Angie Xie’s (left) dissertation defense, a BTP reunion occurred. Xie (left) and fellow BTP trainee now alum Andrew Khalil (right) both interned as trainees at Stem Pharm with Connie Lebakken, who herself was a BTP trainee in the late ’90s. Xie and Khalil were both advised by biomedical engineering professor Bill Murphy, who helped start Stem Pharm with Lebakken. While at UW–Madison in BTP, Lebakken was a student in the Graduate Program in Cellular and Molecular Biology and worked under Alan Rapraeger. Her internship at Promega through BTP opened her eyes to the possibilities in the biotechnology industry and she held various roles in companies before co-founding Stem Pharm. She started Stem Pharm with Bill Murphy, a professor of biomedical engineering at UW–Madison, who is also Khalil and Xie’s advisor. Murphy is actually an alum of the University of Michigan’s Cellular Biotechnology Training Program, BTP’s counterpart there, helping the BTP connection with Stem Pharm span three decades. Their company is involved in developing biomaterials for stem cell discovery and therapy applications. Intellectual property for this technology has been developed in part by BTP trainees, and is being patented by the Wisconsin Alumni Research Foundation (WARF). Stem Pharm is interested in getting materials out of the lab to commercialize them to help “scientists develop better therapeutics and better society,” Lebakken explains. Murphy recently gave the seminar in BTP’s Foundations of Biotechnology class, a course that brings in scientists and entrepreneurs from across campus, the city of Madison, and beyond to introduce students to the highlights of the industry. Khalil says BTP has given him insight into these different issues and how to be successful in the field of biotechnology. As the chief operating officer for her and Murphy’s company, Lebakken says BTP helped her gain those important skills it takes to get the company started.